This is among P's favourite dishes. Actually he likes most things made with saunf (fennel). While grocery shopping the other night, I saw fresh cauliflowers and decided to make this for him. Wash and cut potatoes into cubes. Put in a microwave-safe bowl, add enough water & salt. Cook for 3 mins & then another 2 mins. If potatoes are not soft to the touch yet, cook another 2-3 mins or as needed. Wash and cut cauliflower into medium sized florets. Throw away the thick stems. Boil water in a saucepan, add the florets, salt and turmeric. Cook till the florets are done. 3-5 mins. Add cooked potato & cauliflower to the skillet. Toss well, add salt if required. 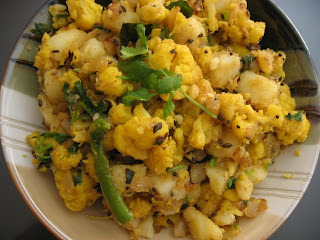 Serve with chhapathi or rice. I usually add the required salt to the cauliflower and potato while cooking. This makes sure that the dish is evenly salty. This is a very easy to make dish and can be cooked in about 20 minutes.